This July 21st will mark the year with a never-happened-before event. Armin Van Buuren will touch down in Cyprus as part of his 2016 World Tour to travel his fans to an unforgettable destination for a night they’ll never forget. The King of Trance will be ruling the decks at an unexpected venue that has never been used before for events: the Old Larnaca Airport, which has been dormant for years after its replacement. In a 6.5-hour event, themed Airports, the entire building will awake and movement will once again reign within its walls, for one night only. The event, presented by COBALT will start at 20:00 with opening acts by nine popular local and international DJs, such as Ruben De Ronde and Playmen, followed by Armin Van Buuren’s 3-hour unique solo set of euphoric trance that will get you partying until the early morning hours. His fans, his originality, his perseverance and his passion make him one of the most influential DJs of our generation, being the only DJ to be voted No.1 DJ in the world five times! 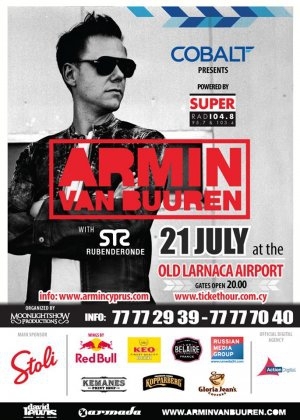 Travel with the King of Trance and relive the buzz of the Old Larnaca Airport in the most magical way. The event is organised by Moonlight Show Productions and powered by SUPER FM.